The Rainmancer Mouse is a breed of mouse found in Moussu Picchu. A powerful magus who can call upon the storm at will, the Rainmancer Mouse resides at the heart of only the most severe of storms, fuelling their awesome power and longevity. 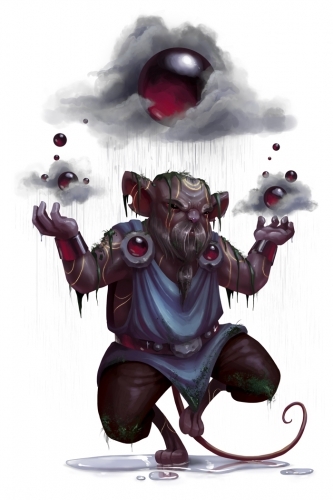 Using storm spheres, he can conjure up neighbouring storm clouds and force them to combine into one massive supercell! The Rainmancer Mouse has been found to be especially attracted to Rainy Cheese cheese, to the point that any other kind of cheese will simply not suffice. Only Shadow, Arcane and Draconic type traps are effective against the Rainmancer Mouse, all other power types are ineffective. The Rainmancer Mouse is only available between 80%-100% rain intensities in Moussu Picchu. It is the only mouse available at 100% rain intensity. 6 September 2017: The Rainmancer Mouse was introduced as part of the Moussu Picchu release. This page was last edited on 17 May 2018, at 16:22.